Pizza is one of the signature dishes in my kitchen. I love to make it, eat it and serve it. On weekends I always have pizza dough in the fridge, ready to be stretched, rolled and made into an impromptu snack or main course. Sometimes I buy fresh pizza dough from Mercato or Lina’s and keep it in the fridge for a quick pizza but mostly I like to make my own dough. I cook the pizzas in a couple of different ways. I have a method for cooking pizza in the oven over a preheated pizza stone, sometimes I grill it in a grill pan on top of the stove and today I broiled it under a very hot broiler, close to the source of the heat. I learned this method from a book I bought a while ago: My Pizza by Jim Lahey, founder of Sullivan Street Bakery and Co. I am not following his broiling method exactly. Lahey suggests to heat the oven to 500℉ for 30 minutes on bake, then to open the door slightly for 30 seconds, and then turn to maximum broil for another 10 minutes before sliding the pizza in. I just heat the broiler for 30 minutes and go with that. You can keep the oven door ajar for 20-30 seconds before sliding the pizza onto the stone, to allow the top element to come back on. Check out Lahey’s fabulous book. I am sure you’ll be inspired to make pizza. I made these two pizzas at the last moment on my way to dinner at the home of dear fiends. 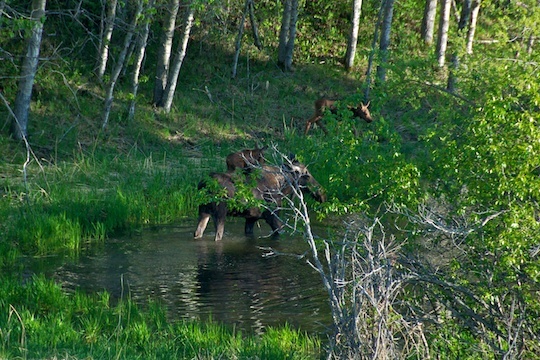 I thought it would be nice to have a small slice with a glass of wine before dinner and I knew they would enjoy it as well. We sat outside on their lovely patio and enjoyed the pizza with a glass of a beautiful Rosé from Silk Scarf Winery in the Okanagan. It was a lovely start to a beautiful evening with close friends. What more can one ask for? The recipe makes 4 smaller or 2 large pizzas. Place water, sugar and yeast in the bowl of a food processor. Sprinkle yeast over the water and pulse once or twice to mix. Let rest 5 minutes to dissolve. Add olive oil and pulse a couple of times to blend. Add 2 cups flour and pulse a few times to mix the flour with the liquid ingredients. Add the rest of the flour until dough forms a ball and pulls away from the sides of the bowl. Continue processing until dough pulls together and develops elasticity. Remove to a floured surface and finish kneading by hand, adding more flour but not too much so the dough remains light. Place ball of dough in an oiled bowl, turning dough to cover with the oil. Let rise until doubles, about 2 hours. If you need more time then either deflate the dough and let it rise once more or place the bowl with the dough in the fridge until you are ready. Bring it to room temperature before proceeding with rolling the dough and shaping the pizza. 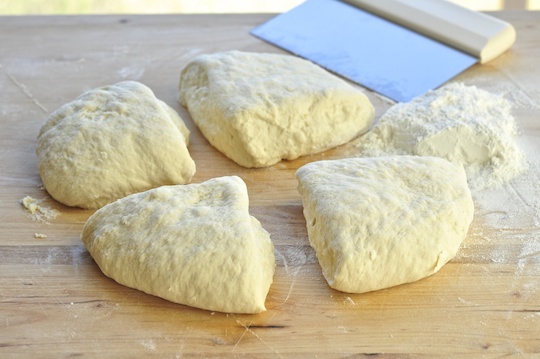 When ready to proceed turn the dough onto a lightly floured surface and cut into 4 pieces. Keep the extra pieces covered while you work with each one. Either roll or stretch the dough into a rough circle (it doesn’t have to be a perfect round, rougher shaped pizza are very attractive). Keep the edges slightly thicker than the center. I let the dough rest between stretches, if the gluten is relaxed it is more likely to stretch and cooperate. Cut parchment paper into squares that the pizzas can fit on. Lay the dough round on the parchment paper, it makes it easy to transfer it into the oven. Brush it with olive oil and then proceed with the topping of your choice. Use a pizza peel or a wide spatula that will fit the entire pizza with the parchment to lift the pizza and then slide the dough still on the parchment sheet onto the pizza stone in the oven. Place a baking stone in the oven about 4 inches below the broiler. Preheat oven at broil setting for 30 minutes. When ready, slide the pizza with the parchment onto the hot stone and broil until the topping is bubbly and the crust is crisp and charred in spots. See below for topping instructions. Place a pizza stone in the oven and set the rack 4 inches from the top element. Preheat the oven to the highest temperature of your broil setting for about 30 minutes. Once you have the pizza dough circles on the parchment (see above) drizzle the dough with olive oil and brush the oil all over the dough. Cut the ripe figs into slices horizontally. 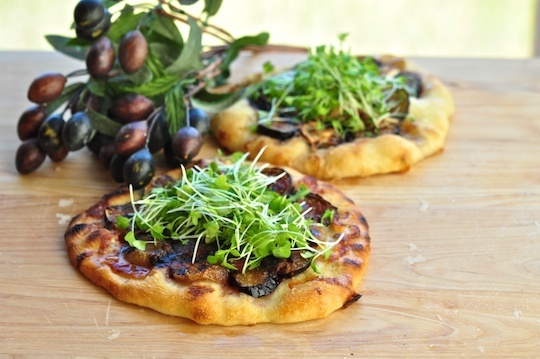 Lay the sliced figs over the pizza, close together and covering the center, leaving about 1/2 inch rim of dough. Cut the Brie into thin slices and lay the slices over the figs. Using a pizza peel slide the pizzas with the parchment into the preheated oven. Once the pizza is under the broiler don’t go away and busy yourself with another task. The pizza is very close to the source of heat and you should watch it so it doesn’t get burnt. Stay with it until it’s done. Cook the pizza until cheese melts and dough puffs up and is cooked through, charred in spots. Remove the pizza from the oven and set on a wire rack to cool a little. Dip a brush in olive oil and brush the crust around the pizza with oil. 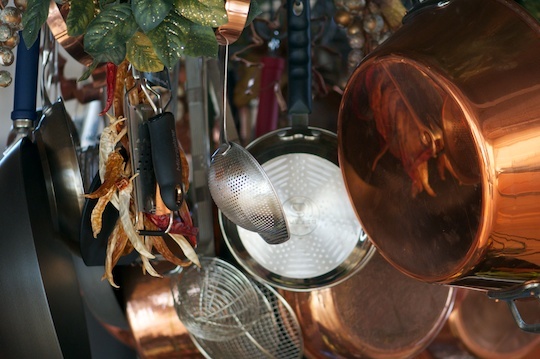 Immediately sprinkle the brushed area with pink Himalayan salt or coarse sea salt. The oil will allow the salt granules to adhere to the crust. Drizzle a little honey over the figs and melted cheese, not too much, just a hint. Garnish with a handful of micro greens, arugula or baby greens and serve immediately. This is officially my new favorite pizza. Hi Amber, thanks for the visit. I have to admit it’s one of my very favs too. If you make it, make sure the figs a really ripe and jammy. It makes a big difference. This sounds like my kind of pizza. I hope to someday be somewhere in the world just the right time to try a fresh fig right from a tree. Hi Val, wouldn’t it be something to pick your own figs for a pizza? Maybe we should all go to Italy together one year, rent a house with a kitchen and just cook fresh local stuff. I like that idea. Let’s work on that:). I think it would be so much fun. I love figs, and brie, and pizza! I have to make this ASAP. Hi Natalie, thanks for stopping by. I think the figs make it special. You can also use Gorgonzola if you like blue cheese. Don’t forget the honey drizzle. Keep me posted. I have been obsessed with fig jam for as long as I can remember and over the summer made a similar style flatbread which I could not get enough of. I used a smoked blue cheese that was melted on the crust and then tossed arugula and lettuces with a toasted pecan, fig vinaigrette, fresh figs and green onions. It was so fresh and good for summer. Now that it is cooler, though, I love the idea of baking the figs and cheese onto the dough. I happen to have a pint in the fridge so I am glad to have seen this! Hi Marina, thanks for stopping by. 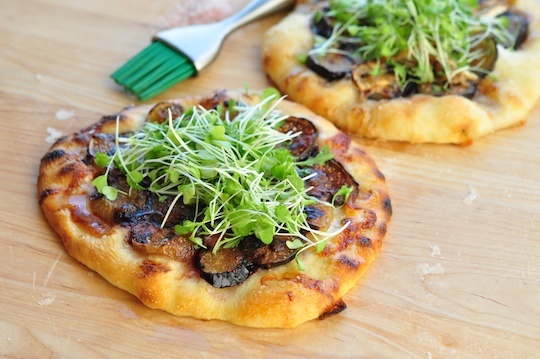 Your fig flatbread sounds delish. I use fig jam as well and even bring it back from trips to the Mediterranean where is it used a lot. 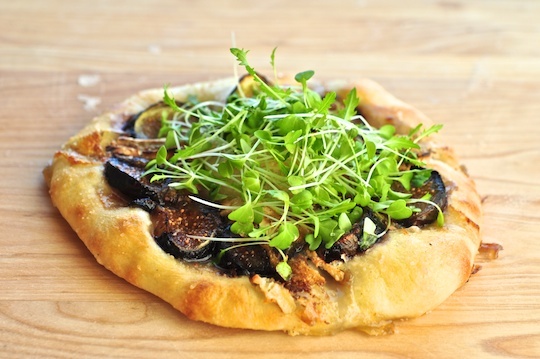 I make this fig pizza with gorgonzola as well, great flavour combination. I browsed your blog and enjoyed it, nice to get acquainted. Loved the cauliflower-pear recipe. Stay in touch. That pizza looks amazing! I love making pizza and normally use a stone in an oven heated to 500, or as high as it will go, and slide the pizza in using a peel. I’ve never turned the broiler on though. The pizza doesn’t burn under the element before the dough is cooked? I’ll have to give this technique a try! I saw fresh figs at my local grocery store the other day, so I’ll give the fig topping a go as well. Thanks for the recipe! Hi Katie, thanks for visiting. I was also surprised at the broiling option but it worked beautifully. You do have to watch it though as it is close to the source of heat and is less forgiving than the middle of the oven. Once I put it in the oven I stay with it until it’s done. The crust cooks right through producing a delicious, crispy pizza. Let me know how it works out. I love your blog by the way, very informative.